Who could be on the Mets' and Yankees' wish list this Black Friday? NEW YORK (WABC) -- Millions of Black Friday shoppers all across the country will flock to stores in search of deals, but right here in New York, the Mets and Yankees could look to make a deal of their own. With less than three weeks to the Major League Baseball Winter Meetings in Orlando, the first major offseason deal could strike at any moment, so why not Black Friday of all days? And why not a deal involving the Mets or the Yankees? This is the offseason for the Mets to make a big splash on the free agency market. The team did a lot of unloading during the regular season when they traded key players: Jay Bruce, Curtis Granderson, Lucas Duda, Neil Walker and Addison Reed, and naturally, they need to hire some replacements. 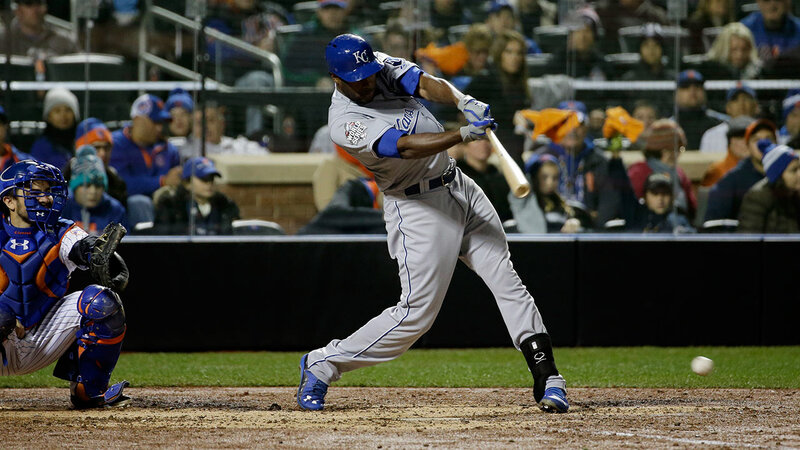 One player that the Mets could look to sign is someone that they are already familiar with, Kansas City Royals' center fielder Lorenzo Cain. The 31-year-old was a key member of the Royals' squad that won it all back in 2015 after defeating the Mets in the World Series, and now he could become a part of the Mets' rebound. Cain would be a huge defensive upgrade for the Mets, who lacked a true starting center fielder last season. Oddly enough, the all-star has not won a gold glove for his excellent work in the outfield, but he has won the Wilson Defensive Player of the Year award twice for the American League in 2012 and 2013, and once for the entire league in 2014. But Cain is more than just a defensive wiz; he can hold his own with the bat, hitting 15 home runs and batting an even .300 in 2017. Cain also makes efficient use of his speed, swiping 26 bases in 28 attempts. Cain's unique combination of speed, defensive and offensive ability would be a perfect fit for the Mets, and his playoff battled spirit could help lift the team back into championship contention. Meanwhile for the Yankees, they are still waiting for Major League Baseball, its players' union and the Japanese commissioner's office to finalize an agreement for a new posting system so that the team can make a run at Japanese two-way star Shohei Ohtani, but they can still make an in-house deal to bring back CC Sabathia for next season. The left-hander turned back the hands of time in 2017, putting up a solid 14-5 record and 3.69 ERA in 27 regular season starts. But it was during the playoffs that the 37-year-old turned his game up a notch and pushed the Yankees to victory in a decisive game 5 against the Cleveland Indians in the ALDS and then delivered a clutch seven inning gem to beat the Houston Astros in game 3 of the ALCS with a 2-0 series deficit. After several underwhelming seasons caused by knee injuries and decreasing fastball velocity, Sabathia has reinvented himself with an arsenal of cutters, curveballs, sliders and changeups. As long as Sabathia's knee continues to hold up, the big-game lefty looks like he has plenty left in the tank to satisfy the Yankees on a short-term deal. There's a flurry of moves just waiting to ignite the MLB hot stove. Black Friday would be a perfect day for the Yankees and Mets to set the tone for the rest of the baseball holiday season.